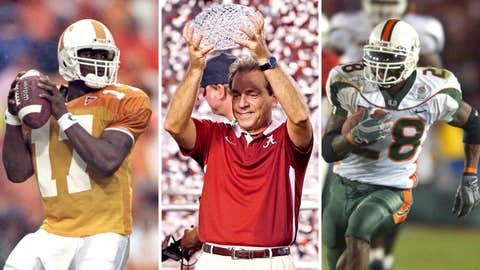 Tee Martin, Nick Saban and Clinton Portis all had their moments in the BCS era. Monday evening, at the Rose Bowl in Pasadena, Calif., the BCS era will officially end. There have been 15 Bowl Championship Series national champions, and a 16th, and final, will be crowned before college football adopts a four-team playoff system for the 2014 season. To send the BCS off in style, we look back at every national champion and talk to some of the participants who’ve filled the last decade-and-a-half of college football with some indelible moments. It was no Peyton, no problem for the Tennessee football team in 1998, as the Volunteers ran the table during the BCS’ inaugural season en route to the first-ever BCS title. But the dream season very nearly wasn’t, as Phil Fulmer’s Vols were lucky to escape the first two games of the post-Peyton Manning era without a loss. The year got started with a trip to the Carrier Dome to face unranked Syracuse and Donovan McNabb. McNabb outdueled Manning’s replacement, Tee Martin, on the stat sheet, as Syracuse put together a furious fourth-quarter rally and took a 33-31 lead with 2:38 left. But it was Martin, making his first career start, who got the last laugh, guiding a nine-play, 72-yard drive to set up Jeff Hall’s 27-yard game-winning field goal as time expired. Tennessee returned to Neyland Stadium for its second game of the season, and the defense showed up, holding No. 2-ranked Florida to minus-13 yards rushing on 30 carries. But Martin again struggled, completing just 7 of 20 passes for 64 yards, as the Gators forced overtime. Tennessee took the lead on a Hall field goal in overtime, however, and UF kicker Collins Cooper couldn’t match it, giving the Vols something it never got with Manning in the backfield — a win over the Gators. Things got a little easier from there, and Martin seemingly found his stride during a blowout win over Houston. There would be close calls against Auburn and Arkansas — a win that would have never happened without a befuddling Clint Stoerner fumble late — and then Mississippi State in the SEC Championship Game, but Tennessee did what it had to and landed in the Fiesta Bowl, where it was an underdog to No. 2 Florida State with a championship at stake. In the championship game, wideout Peerless Price lived up to his name, catching four passes for 199 yards — including a 76-yard catch to set up Tennessee’s first touchdown, and a 79-yard catch for the Vols’ last — and the Vols kept the FSU offense at bay in a 23-16 win. The victory gave Tennessee its first national title in 47 years. Redemption was the game for Florida State in 1999, as it entered the season looking to shake off the previous year’s Fiesta Bowl loss to Tennessee. 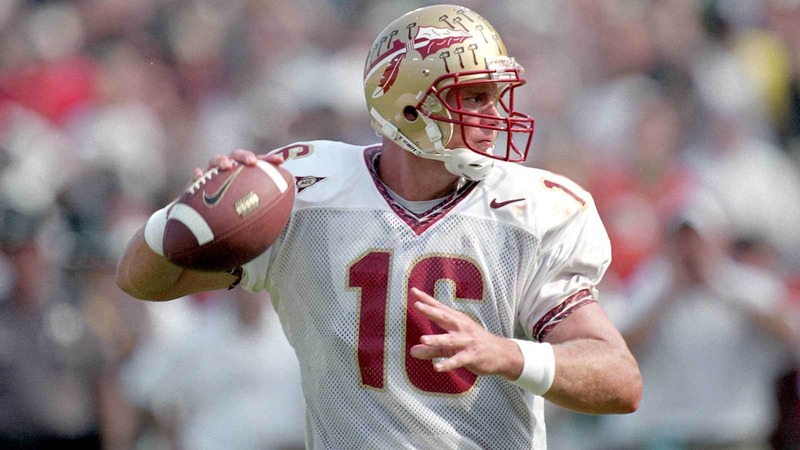 And the Seminoles, led by quarterback Chris Weinke, could think of no better way to find that atonement than aiming for an objective that had, at that point, yet to be accomplished. But such a run was easier said than done, and the ‘Noles spent the ‘99 season fending off every opponent’s best shot, including down-to-the-wire wins over Georgia Tech, Miami, Clemson and arch rival Florida. “There is a target on your back when you’re ranked No. 1 and historically, over the years, we’ve seen that no. 1 team lose that position a number of times,” Weinke said. An 11-0 regular season would put FSU back in the BCS championship game again — this time at the Sugar Bowl in New Orleans — but after a relentless attack got them there, self-righteousness nearly got the best of the ‘Noles against Virginia Tech, as the Hokies overcame deficits of 14-0 and 28-14 to take a 29-28 lead after three quarters. “Like anything else, I think if you get out to an early lead and things are going well for you, human nature allows complacency to set in,” said Weinke, who threw for 329 yards and four touchdowns in the title game. Florida State responded with 18 points in the first 7:18 of the fourth quarter, capped off by a 43-yard touchdown from Weinke to game MVP Peter Warrick, as the ‘Noles took home a national title and claimed the “wire-to-wire” championship it set out for from the beginning. After going 7-5 in the first year of the Bob Stoops era, Oklahoma didn’t necessarily enter the 2000 season with national championship ambitions. In fact, when the Sooners looked ahead to an intimidating October slate that included Texas, Kansas State and Nebraska, they figured they’d be fortunate just to compete. “Before the season, people around the program, outside of the program, felt like if we could steal one of those games it would be a successful year,” said quarterback Josh Heupel. But Oklahoma dismantled Texas at the Cotton Bowl in the Red River Rivalry game and left Dallas with a whole new outlook on the season. After the win over Texas, OU traveled to Manhattan, Kan., where it knocked off No. 2 Kansas State, then returned home to rout No. 1 Nebraska. Suddenly, it was the Sooners who were No. 1 in the country and in the driver’s seat headed toward a BCS title that, a month prior, seemed impossible. However, even a top ranking and an undefeated record couldn’t give the Sooners an edge in the 2001 Orange Bowl, where they were double-digit underdogs to a Florida State team playing for the national title for the third consecutive year. But the projections — as they had all season — meant little to Oklahoma, which used a dominant defensive performance to dethrone the Seminoles and Heisman winner Chris Weinke, 13-2. Even 12 years later, Clinton Portis won’t hesitate to tell you that the 2001 Miami Hurricanes were the best college football team of all time. If you look at UM’s dominant run to that year’s BCS title, there’s a case to be made that the former star running back might be right. After being shut out of the BCS title game in 2000, despite being ranked higher in the human polls than FSU — which it had beaten head-to-head — the ‘01 Hurricanes set out to leave no question who the best team in the country was. “I think everybody was so hurt — it wasn’t even a big issue like, ‘Oh man, we got cheated out of the game;’ it was more like, ‘We know what we’ve got to do,’” Portis said. Miami cruised, virtually unchallenged, through its regular-season schedule, setting up a date with Nebraska in the Rose Bowl. The worst beating, though, was saved for Washington, whose stunning upset of Miami the previous season kept the ‘Canes out of the BCS title game. Originally scheduled for Sept. 15, 2001, the UM-Washington game was postponed after 9/11, and when the teams eventually played in November, Miami let out a year’s worth of frustration in a 65-7 win. That year’s BCS championship game featured its share of controversy, with Nebraska, which was ranked No. 4 in both human polls, jumping No. 2 Oregon and No. 3 Colorado — a two-loss team that had beaten Nebraska by 26 points head-to-head — to face the ‘Canes. But the opponent meant little to a Miami team that felt it was destined to run the table. And sure enough, Miami took care of business, taking an effortless 34-0 halftime lead before letting off the gas in the second half of a 37-14 win. Yes, former Ohio State quarterback Craig Krenzel thinks referee Terry Porter made the right call when he flagged Glenn Sharpe for pass interference on Chris Gamble on fourth-and-3 in overtime, with the Buckeyes trailing 24-17. The call gave Ohio State a new set of downs and eventually paved the way to a 31-24 win in the second extra period. You can look at the video above and judge for yourself, but for doubters who are still unconvinced, Krenzel would also like to remind you how that call was only made possible by another missed call late in the fourth quarter. “People that want to point to that one single play — ’Oh, the refs blew the game on that one single play’ — but in the fourth quarter we’re trying to run out the clock, and I completed a pass to Chris Gamble on the sideline (that was ruled incomplete),” Krenzel said. “You look at the replay, he had knee down, in bounds, clearly a catch; we would have run out the clock. Of course, even if Porter got it wrong, there’s nothing that could be done about it now, but Krenzel rests easy knowing that Ohio State won the game fair and square. 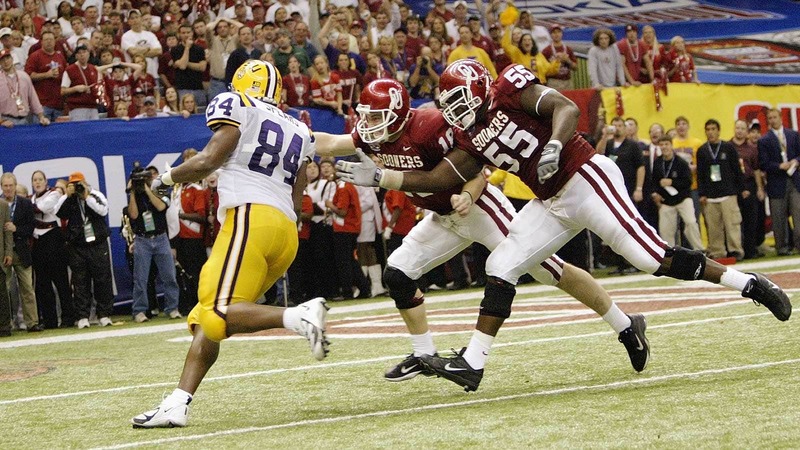 LSU’s top-ranked defense held Oklahoma’s top-ranked offense to just a touchdown in the first half of the 2004 Sugar Bowl, but at halftime, with his team leading 14-7, coach Nick Saban pulled Tigers defensive end Marcus Spears aside. Apparently the message got through, too, because Spears did just that on the second play of the third quarter, intercepting a Jason White pass and returning it 20 yards for the touchdown that ultimately sealed the BCS title for LSU. “It was a product of film study,” said Spears, who went on to play nine years in the NFL. “They had been known for running that slant route on anything between third-and-5 to third-and-7 … so I knew it would possibly be in that area, and my whole thought process was to get in the lane and make Jason White pull it down and the blitz would get to him. For Spears, a Baton Rouge, La., native, winning a title so close to home — and so close to campus — meant the world. “It was amazing — almost like winning a Super Bowl in the NFL in the city that your team plays in,” Spears said. “I still can’t put it into words, man. Every last one of my family members was at the game. When we walked out into the Superdome, it looked like I had a whole section at the game. Not everyone was so thrilled, though. USC, which did not play in the BCS Championship despite being ranked No. 1 in both human polls, still claims 2004 as a split national title — and all power to them, says Spears. “If you didn’t play in the game that they are naming the national championship, there’s no way you can be a national champion,” Spears said. “You can’t say you’re the NBA champion because you’ve got the same record at the end of the year as the NBA champion. You’ve got to play in the game, and they didn’t. A year after getting cheated out of a BCS championship shot they felt they earned, the USC football team was stripped of a title it actually won — but the aftermath means little to former Trojans players, including starting tight end Alex Holmes. “At the end of the day, we all still have our national championship rings and they can never take that away,” Holmes said. “We beat Oklahoma — we thoroughly dismantled them — and the whole country saw it. No one can say anything to us. Of course, the Sooners, whose 55-19 defeat was the most lopsided loss in BCS Championship Game history, would probably just as soon forget. According to Holmes, they were begging for mercy before the game was even over. “I don’t think anybody thought that we were going to beat those guys by 40 or 50 points, but after we watched film, we knew we were going to beat them,” Holmes said. 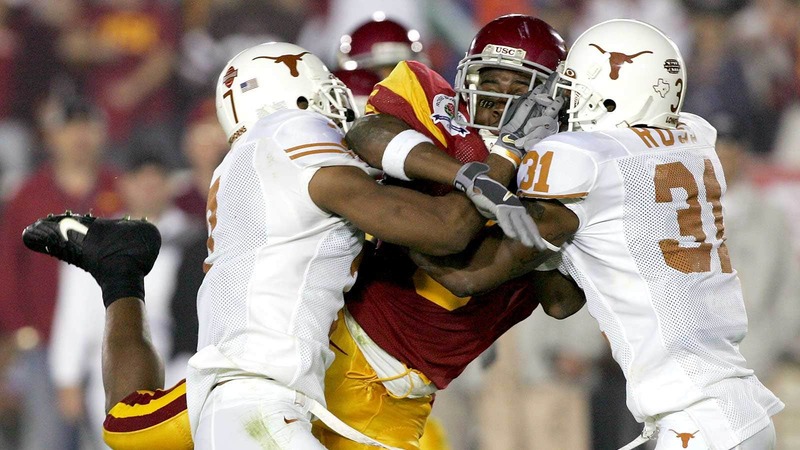 Officially, no one won the BCS title that year, as USC had its championship vacated as part of the NCAA sanctions that also cost Reggie Bush the 2005 Heisman — though Matt Leinart got to keep his from 2004. But Holmes doesn’t need a crystal trophy to validate what the school accomplished that year. “The NCAA is a very flawed system, and even the biggest Notre Dame fan or UCLA fan or Alabama fan, if they look at it and they look at the evidence in the case, and then they look and see what happens at other schools, they’d say, ‘OK, someone just had it out for SC,’” Holmes said. Some national championship teams come from nowhere, but not this one. The 2004 Texas Longhorns came about as close they could have to a national championship without actually playing for it. They went 11-1, their only loss coming to No. 2 Oklahoma, and beat Michigan in the Rose Bowl. The 2005 season began with USC ranked No. 1 and Texas No. 2, and that’s how it stayed for 13 consecutive weeks. USC had two Heisman Trophy winners (Matt Leinart and Reggie Bush) and was coming off back-to-back national championships (2003 was an Associated Press title – LSU won the BCS version). It was a rare opportunity for Texas to play the underdog, and it set up one of the greatest games of the BCS era. Texas won 41-38, the biggest reason for that being the Zeus-among-mortals performance of quarterback Vince Young, who ran for a touchdown and a two-point conversion with 19 seconds left to give UT its fourth national championship. Florida had a perfectly fine season in its first year under Urban Meyer. The Gators went 9-3 with two wins over top-five teams, but it was still the first season under a new coach with a new system. Meyer’s spread offense wasn’t humming yet. “The transition of a new coach coming in and learning a new offense, being under our third offensive coordinator for all us seniors, there’s a transition period you have go through,” quarterback Chris Leak (2003-06) said. In 2006, though, the Gators had a senior starting quarterback in Leak, a fiery bulldozer of a backup quarterback in Tim Tebow and had played the toughest schedule in the country by winning percentage even before it met Ohio State in the championship game. “We had a lot of confidence in our body of work against the teams we were able to get victories against in the SEC that we were doing to go into that game battle-tested,” Leak said. The Gators lost one game, 27-17 at No. 11 Auburn, and had five one-possession wins (21-20 at Tennessee, 21-14 against Georgia, 25-19 at Vanderbilt, 17-16 at South Carolina and 21-14 at Florida State). By the time Florida faced Ohio State in the national championship game, the Gators felt like they had been through it all. A 41-14 win over the Buckeyes gave rise to the idea of “SEC speed” and kicked off a run of seven consecutive championships for the league (it can become eight this season). It also was a wild time in Gainesville. From 2006-09, Florida won a combined four national championships in football and men’s basketball. 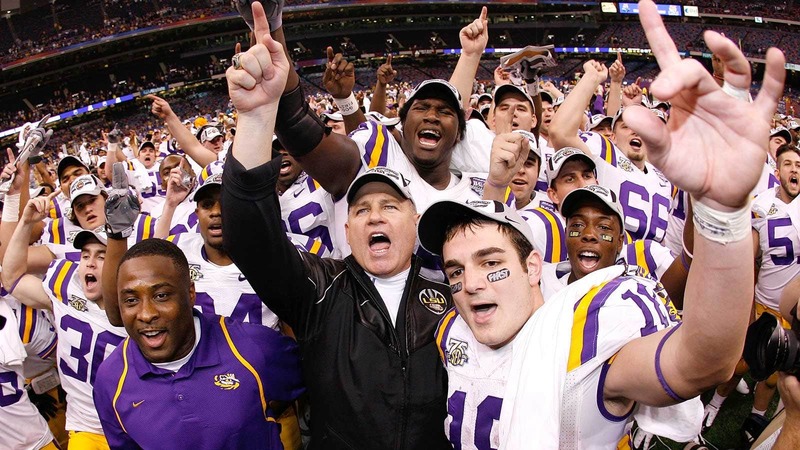 If there was ever such a thing as a team of destiny, the 2007-08 LSU Tigers would have to be it. Because in a system where one loss is usually a fatal blow for a team with championship ambitions, that year’s LSU squad became the first and only two-loss team to win a BCS title. LSU opened the 2007 season ranked No. 2 in the country and by October had moved up to No. 1. But a trip to Lexington appeared to dash LSU’s hopes of a first championship under Les Miles, as Kentucky upset the Tigers in triple-overtime. Four weeks later, however, LSU had reclaimed its spot atop the polls and in control of its own destiny — in part because of wins over ranked Alabama and Auburn teams, but mostly on account of losses by three No. 2-ranked teams (South Florida, Boston College and Oregon) and one top-ranked team (Ohio State) in that span. But yet again, the Tigers would see their hopes vanish in front of their eyes — or so it seemed — in yet another triple-overtime loss, this one coming at home against Arkansas. For evidence of that, one has to look no further than LSU’s 38-24 win over Ohio State in the BCS Championship, a win that was helped along by two touchdown catches from Dickson, who was playing just a short drive from his hometown of Ocean Springs, Miss. At 12-2, LSU might not have looked like the most impressive BCS champ, but it was certainly deserving. It was Oklahoma’s first possession of the 2008 BCS national championship game, and quarterback Sam Bradford had driven the Sooners into Florida territory. The Gators needed a big play, and outside linebacker Brandon Hicks (2007-10) took a big risk in order to make one. On second-and-10 from the Florida 38, Hicks had coverage responsibilities on Oklahoma’s tight end. When the tight end didn’t go out for a pattern, Hicks took off after Bradford and ran like hell, hoping the tight end hadn’t tricked him, and leaked out. The play went for a loss of 14, Oklahoma punted and Florida won 24-14, taking home its third national championship. Chances are, though, what you remember about that season was not the BCS national championship game, but Florida quarterback Tim Tebow’s famous rant after the Gators lost to Ole Miss. That quote has been immortalized on Florida’s campus and it ostensibly was a motivator for Tebow’s teammates, but that particular moment was more for the public. “We didn’t see any of it until a couple days later,” Hicks said. The Tide’s run began in coach Nick Saban’s third season with a win over No. 7 Virginia Tech in the season opener. Alabama was No. 1 by the end of October, but even though it hadn’t lost, Alabama spent the first two weeks of November looking up at Florida and Texas in the BCS standings. For defensive back Dre Kirkpatrick, the first championship was the toughest to win. A blowout win over the Gators in the SEC championship game set a date with Texas in the Rose Bowl for the national title, a game billed as a showdown between SEC defense and Big 12 offense. 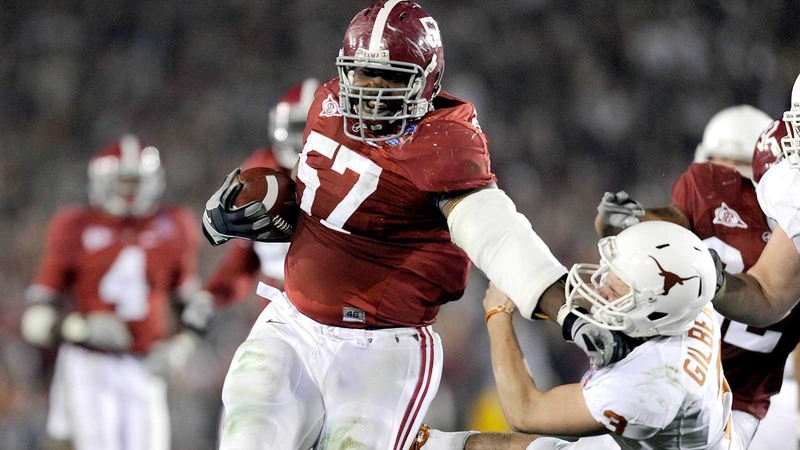 On Texas’ fifth offensive play, Alabama lineman Marcell Dareus knocked UT quarterback Colt McCoy out of the game. And at precisely that moment, Alabama replaced Texas as the dominant program in college football. UT’s backup quarterback, freshman Garrett Gilbert, went 15-for-40 with four interceptions and Alabama, no longer fearing the Longhorns’ scoring ability, just started handing it to running backs Mark Ingram and Trent Richardson. Alabama quarterback Greg McIlroy attempted just 11 passes (for 58 yards) and the Tide won 37-28. When Mike Blanc looks back at the 2010 Auburn Tigers, the first thing that comes to mind is a missions trip the team took to the Dominican Republic before the season. That Auburn team was not supposed to be a national championship contender. It had gone 8-5 under first-year coach Gene Chizik the year before, and Chizik’s hiring hadn’t inspired a great deal of confidence, considering he went 5-19 in two seasons at Iowa State. Well, there is an axiom in coaching that all coaches are about as good as the guy taking the snaps, and in 2010 Auburn wound up with a juco transfer named Cam Newton, who turned out to be one of the best collegiate quarterbacks of all time. Newton accounted for 4,381 yards and 50 touchdowns during his only season at Auburn, and he led Auburn back from a 24-0 deficit against Alabama to a 28-27 win. He was an easy choice for the Heisman Trophy and seemingly unfazed by his being the center of an eligibility scandal that dominated the media for most of the season. Auburn capped it off with a 22-19 win over Oregon in Glendale, Ariz., and the turning point was a safety recorded by Blanc. Auburn was down 11-7, when Blanc noticed an Oregon formation giveaway he had seen on film. Blanc’s safety made it 11-9 Oregon, and Auburn drove for a touchdown off the safety to make it 16-11 and never trailed again. Alabama’s appearance in the 2011 national championship game did more to popularize the idea of a playoff in college football than any columnist or pundit ever could. The basic argument against Alabama was this: If you didn’t even win your conference’s division, you don’t deserve to play for the national championship. 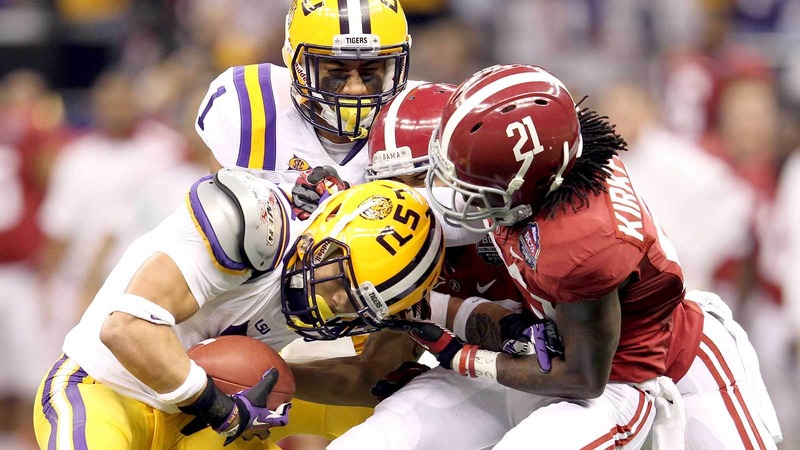 It didn’t help that Alabama’s loss had been a dreadful, touchdown-less 9-6 overtime affair against LSU. Everyone seemed to agree, even afterward, that LSU and Alabama were the two best teams in the country, but the idea was that Alabama had its chance, and lost, and maybe Oklahoma State ought to get its shot at LSU. Well, Oklahoma State blew it by losing to Iowa State, and so the national championship game was an LSU-Alabama rematch. And it wasn’t much prettier the second time around. LSU had a hell of a time just getting the ball past the 50-yard line, Alabama won 21-0 and the Crimson Tide pretty much felt like they had shut everybody up about that Oklahoma State thing. For unaffiliated college football fans, the most memorable thing about Alabama’s championship season wasn’t an Alabama win or even an Alabama player. It was Texas A&M quarterback Johnny Manziel, whose jaw-dropping performance in Tuscaloosa ruined Alabama’s perfect season and won him the Heisman Trophy. To Square, the Texas A&M game existed in a vacuum, bearing little relationship to the rest of Alabama’s season. By then, though, Alabama had enough of a reputation that one loss was hardly a deal breaker for voters. The Tide opened the season with a 41-14 win over No. 8 Michigan, beat No. 3 Georgia in the SEC championship game and slaughtered Manti Te’o and No. 1 Notre Dame, 42-14, in the BCS national championship game.